Book Activity: Snip, Snip, Snow! Snip, Snip, Snow! by Nancy Poydar tells the story of a relatable, spunky girl named Sophie, who can’t wait for the snow to fall! Her excitement turns to disappointment as the storm is stalled. In its place, Sophie and her friends begin cutting paper snowflakes, creating their own snowstorm. Caught up in their own fun, the first real snowflake almost goes unnoticed. The children run outside to enjoy the new snow! This story is so well-written and the illustrations really draw you in. The book also includes instructions for making paper snowflakes, just like Sophie did! 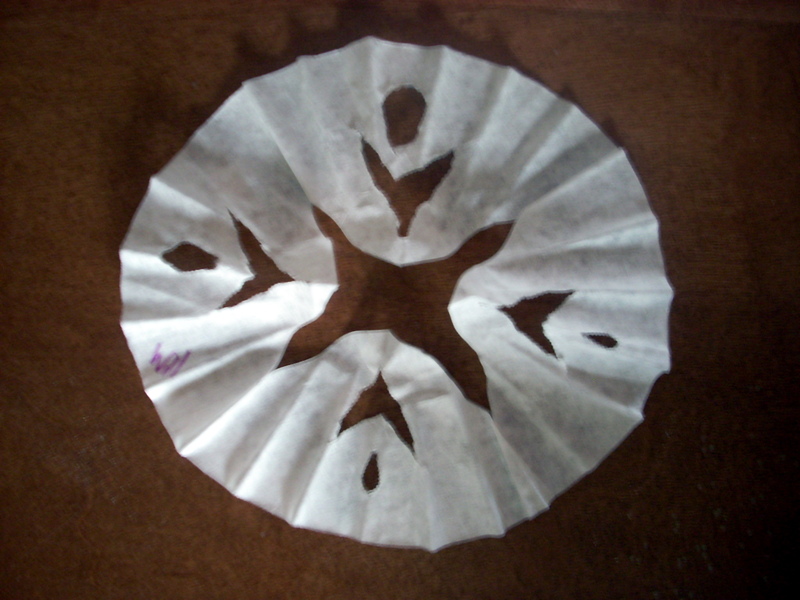 One way to simplify your snowflake making process is by using coffee filters instead of paper. This way, you already have a circle, rather than having to cut circles as the instructions in the book recommend. Perhaps more importantly, the filters are much thinner and easier for small hands to cut through. Simply fold the filter in half a few times and start cutting. Soon you’ll have your own paper snowstorm, just like Sophie! Making snowflakes not only extends the literacy experience, creating more connections and increasing comprehension, but the activity builds small motor skills and creativity. Tape the flakes to your windows, mount them on colorful paper, and/or hang them from the ceiling. Whether you live in Alaska or Arizona, soon you’ll have your own indoor winter wonderland! What a cute book and activity for these snowy days! I love starting with a great picture book then extending the story through music and art! A great book is my favorite activity starter! I’m so glad you’re still reading here at this crazy time of year! Thanks!